The story takes place in the 1970s and its spirit of an independent press must be resurrected today. The Post is a timely reminder of the importance of a free press and its role in society. And it’s a call for vigilance in politics, in media and in community. Based on actual events, The Post is set during the volatile period of the Vietnam War. The U.S. government had been crafting a document about relations with Vietnam during the past 30 years. And that document — a survey of the geo-political landscape — clearly indicated the U.S. was not capable of winning the Vietnam War. The gist of the matter boiled down to placing a priority on political face-saving over human life-saving strategies as politicians stepped in front of cameras and boasted of the progress being made in one of the ugliest chapters in U.S. history. In the thick of the madness, the New York Times managed to obtain through clandestine means thousands of pages from the report, a disorganized shamble of inquiries tidily dubbed The Pentagon Papers. Publication of portions of those documents in the Times led to the wrath of the White House and a threat to a free press intended to protect democracy. At the same time, a family-owned, local newspaper under the leadership of a woman (a woeful rarity in that era) was struggling to keep pace with the Times (take that figuratively and literally). That local paper was also fighting for capital to remain a viable business, looking to go public and seeking strategies to grow its readership and reach — ultimately with eyes on becoming a national paper. That’s a tall order for a broadsheet that couldn’t even get a press pass to the Nixon-Cox wedding. That embattled little paper was the Washington Post and its actions in support of the Times’ publication of the documents helped create a free press movement that continues today in the wake of WikiLeaks and other debates regarding the public interest. It turns out the Vietnam scandal had been boiling for generations, with the scalding-hot pot being handed over from one administration to the next: Truman, Eisenhower, Kennedy, Johnson, Nixon. Take your pick. Democrat or Republican, the people in power need to be held accountable. And, in modern times, that includes names like Trump. Surely that’s the lead story for many: Trump picks fights with the Washington Post, much like Nixon did back in the ’70s. But that’s a partisan view. An honest assessment would say the media needs to shape up all around: Regardless of whether the subject’s name is Trump — or Clinton or Obama — the media needs to do a better job of being impartial, holding each administration at arm’s length and to the uniformly highest standards. The Post rather elegantly presents this base need for a natural tension between press and politicians. So much is so wrong with modern media and the 24/7 news cycle that prioritizes being first over being accurate. Advocacy without objectivity is dangerous. To do otherwise is to simply push the pendulum from one side to the next, helping old victims while creating new victims. This approach will never attain the ultimate goal of justice for all. The bulk of The Post is about things being put on paper, either for private reference or public consumption. It’s about ideas, concepts. It’s about rights. None of that is visually-striking — unless you’re a director like Steven Spielberg. With The Post, Spielberg trades in benchmark action scenes from movies like Raiders of the Lost Ark and Jurassic Park and goes for the drama. It doesn’t hurt to reteam with Tom Hanks (Saving Private Ryan, Catch Me If You Can, The Terminal). And, for the first time, Spielberg brings Meryl Streep (The Iron Lady, Florence Foster Jenkins) into his fold of trusted talent. 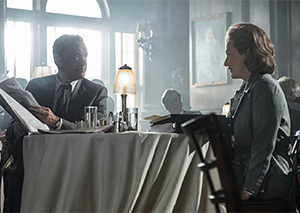 Together, this ménage à trois of movie mastery stages extended takes of dialogue delivered with perfection, particularly one discussion set in a restaurant as Ben Bradlee (Hanks) and Kay Graham (Streep) talk shop. Spielberg documents a tactile world as reporters sift through thousands of disorganized pages and clack away at typewriters, then pass their words on to typesetters who go through a painstaking manual process to layout pages and get ready for the gigantic print machinery. And, speaking of tactile, Spielberg shot The Post using Kodak film. Give seemingly dry material to master storytellers and let them work their magic. The Post works so well, it should be added into journalism courses, serving as the starting point for honest discussions around the ideas and topics it presents — in open, vigorous debate. Back in the ’70s, an attempt was made to explain away the Pentagon Papers with a ridiculous spin. Supposedly, the survey was commissioned to serve as an academic record — something to be read in the future, after the fact, with the perfect vision of hindsight allowing to provide a better historical perspective on the matter. In the meantime, lives were being lost at an alarming rate. Including the lives of those with loved ones back home who supported the war effort because of the information being doled out under disingenuous or misguided reporting. And, so fittingly, The Post concludes with the Watergate break-in. It’s a chilling conclusion that serves as a seamless prequel to another J-school movie classic, All the President’s Men. Yeah. Woodward and Bernstein and the story they broke for that same Washington Post, allowing the Post to finally step out from the shadow of the Times.